Storming Robots Robotics Club is an engineering program for children from grades 4 to 12. We MUST emphasize that our programs: focus on using Robotics Projects to instill and strengthen engineering disciplines and analytical mind, not just robotics itself. See our Culture and Motto. Comprises of subgroups that allow participants to focus on their interests and strengths, as well as from elementary to college level challenge. Trimester-based, two or more hours weekly meetings. Divided by students' levels, not age. Structured with Application-based, Open-ended Challenges, but Goal-oriented. Opportunity to engage in projects involving AI algorithms, as well as AI-oriented robotics competitions. Visit our calendar page to see a detailed weekly schedule. Be proficient in Mathematics, writing, and reading for their grade levels. Have a positive learning attitude. Have the desire to enrich themselves in robotics and math. Love technical, hands-on projects, thinking outside the box. Be willing to work with others and conform to our code of conduct. Starting from Spring (late March) of 2019, the same evaluation process as for Gr. 4 to 6. Submit an application here. In the application, you will be asked also to sign up for assessment session. If you are unable to attend an evaluation session, please email to our Program Coordinator to discuss alternative. You will be informed eligibility status within one to two business days - Tue-Sat. Please note that the assessment is subject to $25.00 fee. Work hard, play hard, have fun in learning robotics and programming, and take pride in their efforts. Develop a problem-solving mentality, analytical mind. Love exploring how stuff works. Share and have Fun in Doing and Creating. Our students are enthusiastic, and many come back year after year. Over 90% students returning rate! Many travel for more than 35 minutes to attend each year, from locations as far away as Bergan County and Monmouth County, New Jersey, and Newtown and Allentown, Pennsylvania. Roboclub students have the opportunity to compete at the international level. Since 2011, our teams have won world titles in various competitions. Our advanced students and their impressive achievements have been featured by major media outlets, including MSNBC and the BBC, as well as Robot magazine. Visit our Testimonials page to read feedback from parents, see where our students have been accepted to college, and learn more about what they’ve achieved. Our programs offer a scaffolding learning roadmap that students follow from grade 4 to 12. 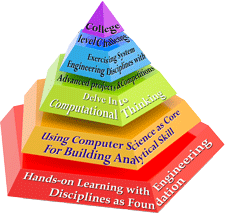 Programs for students in grades 8 to 12 usually involve projects that require algorithmic and computational thinking and analysis. For the students who have been with us for several years, we provide detailed guidance. Individualized roadmaps are created for their four years in high school based on their personal learning style, interests, strengths and weaknesses. We have found that this helps students to define themselves clearly and boosts their competitiveness in the college application process. Many students joined Storming Robots since their primary school years until they graduated to College. They continuously accumulate their engineering in robotics and computer science knowledge. We provided opportunity to cover advanced level work. We do not use the term 'Advanced' loosely in order to boost enrollment. Advanced level usually means work reaching college level, which boost their competitiveness in entering college engineering project teams during college years. If you are one of our roboclub parents, you may Email us to inquire a copy of the detailed roadmap. The most outstanding roboclub members who demonstrate maturity to self-discipline will be selected to perform mentorship for robotics classes, competitive teams, and even competitive events coordination. They will have opportunity to actively be involved in creating visions and plans, trying to articulate them, and exercise the commitment to completion. Through mentorship, they truly gain the sense of leadership in dedication, integrity, assertivenes, magnanimity, and humility. This forum, is designed for our students, all between age 10 and 18. For security purpose, only students and parents will be given access to the forum. All other registration requests will be rejected. In addition, all postings will be closely monitored. Strengthen process of thinking in engineering. Encourage knowledge exchange in the realm of robotics. Meet others who have similar interests and caliber. Open Communication among team members at all time. An online site where you will find various levels of tutorials, sample codes, and exercises. An online site where you will find suggestions on hardward and software. You may access the Cost Table here. Learn about automation and systems engineering through hands-on robotics projects. Focus on challenges that are application-based, open-ended and goal-oriented, exercising their problem-solving and higher-order thinking skills. Immerse themselves in a challenging and engaging hands-on environment, allowing them to delve deeply into robotics. Capitalize on their creativity within various engineering disciplines. Work through the entire engineering process, from coming up with an idea and a goal to planning and executing an iterative development process to success! Have opportunity to take on level of technical challenge not commonly present in conventional grades schools. We choose the name "club" instead of "class" for the lack of less intimidating words, because we do not want to make kids feel that that is an extension of formal classroom environment. This subgroup has four levels. Levels II through IV go beyond what is covered in Advanced Placement Computer Science A. - Are interested in software development. - Wish to pursue more advanced robotics projects. - Want to pursue college computer science level. - click here for more details about this sub-group. Our networked computers lab contains a multitude of programming environments to choose from, including a sophisticated, but intuitive graphical interfaced programming language, and different flavors of C compilers for the RCX and NXT platforms. Internet access is facilitated for accessing educational and teaching resources only.